The correct spelling is Newell Narine. He leased the house from James Kip. He never owned or sold the house. Narine went to debtors prison in 1796 and Kip leased it to Peter Laing who later bought it. Where did you get the information about John Pickel? Thank you for the clarifications. I made the corrections. I need to backtrack to find the real estate records on Pikel. My great grandfather Edward Androvette owned this building in the 1920's. He gave a great deal of money to the Water Street Mission. Did your grandfather ever comment about the speakeasy in today's kitchen section of the building? Exactly what years did he own the building? Was John Pikel connected to Rudy's Hungarian Restaurant operating in the building during part of Prohibition? 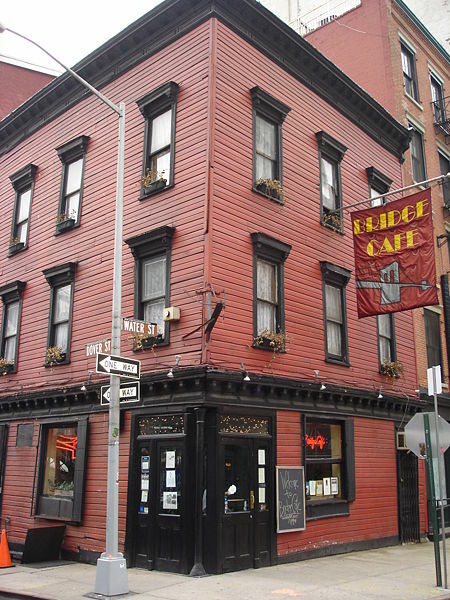 The speakeasy was located in what is today the Bridge Cafe's kitchen and was run by Mike McCormack. Charlie Brennan delivered his booze to McCormack. Rudy did serve cider but I have no information about him serving booze. My Great Grandfather died before I was born. I know he owned the building in 1926. He was a member of the Union Church in Brooklyn. My Grandmothers brother, John McCormack, sold this bar in 1979. My Dad worked there as a teenager and his early adult years. We celebrated many family holidays and events there when I was a small girl.